The Google-Yahoo ad deal which both companies signed in to about four months ago is dead. Google today, walked away from the proposed partnership with Yahoo to avoid a legal battle with federal antitrust regulators who had notified the companies that they were planning to file a lawsuit to block the agreement. 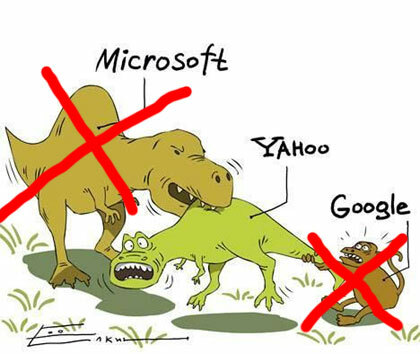 The decision to kill the deal has set back both Google and Yahoo which had high hopes for the partnership. The deal would have given Google a major advantage over every web company by having a certain amount of control on the web’s second largest company, Yahoo. Yahoo on the other hand would have seen some growth that would definitely salvage their ailing company back into shape. "After four months of review, including discussions of various possible changes to the agreement, it’s clear that government regulators and some advertisers continue to have concerns about the agreement," David Drummond, Google’s chief legal officer, wrote. Of course, the most affected in this event is Yahoo. Recall that Yahoo chose to enter into the agreement with Google over Microsoft’s $44 billion offer. Now, with Google walking away and Microsoft no longer interested in acquiring them, Yahoo is left scrambling for a growth plan.